Will You Win or Lose at Bluffing? Players place a numbered feather card behind their headbands. Guess the sum of all the feathers, even though you canâ€™t see your own & it might be negative! Bluff the best & become chief of the next Pow Wow! A fantastic bluffing game that is just plain silly fun. My family gets a kick out of the feathers on your head. 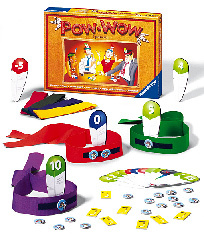 This bluffing game has some strategy, as some special feathers bring some interesting twists. Fun family game.